Alfred's Default Results are the ones presented to you when you search without prefixing your search term with a keyword. They include your Applications, Contacts and Preferences by default, but you can modify these to fit your own needs. If you're completely new to searching using Alfred, a good place to start is our "First 5 minutes with Alfred" guide. Default results are the first results you'll see when you search Alfred without prefixing your search with a keyword. You'll find these settings in Alfred's Preferences under Features > Default Results. There are three areas to look at to tell Alfred what kind of results you want to see; File types, search scope and fallback searches. First, choose the types of files you want to see in your default results. You can add additional file types to your default results by checking the boxes in Alfred's preferences under Features > Default Results. If you're a Powerpack user, you can create a File Filter Workflow for custom searches for particular file types or search scopes. It's a brilliant way to search for file types you need often; for example, a File Filter to search for all images in your Documents folder. However, using File Filters or the "open" and "find" keywords is the recommended way to expand your search. Take a look at the Web Bookmarks feature to include Safari and Chrome bookmarks to your results. You can either browse these using their own keyword prefix or by including them in your default results. The search scope is set to include all of the usual locations where files and applications are likely to be found. If you store applications or files outside of the default set of folders, you can add paths to Alfred's scope. You can add to the scope either by pressing the + button at the top right of the Search Scope box, or by dragging a folder from Finder into that box. If you encounter issues and files are no longer found, you can use the "Reset" button to revert to Alfred's default search scope. Fallback searches are the search options Alfred presents to you when he can't find results locally on your Mac. By default, these are Google, Wikipedia and Amazon. Powerpack users can customise these to use different web searches, custom searches or workflows, and we've created a tutorial on setting up your own fallback searches. 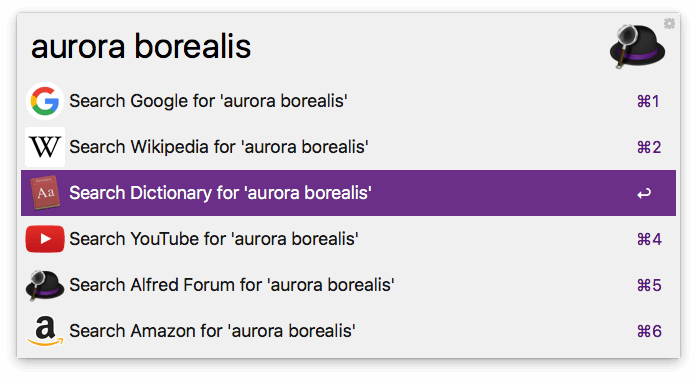 To set your fallback searches, open Alfred's preferences to Features > Default Results and click "Setup fallback searches" at the bottom of the pane. You can then choose your own fallback searches. You can use any default web search, custom search or fallback search trigger as a custom fallback search.